Chief Marketing Strategist at CAE Marketing & Consulting, Inc.
Carlos is a digital marketing consultant with 18 years of proven internet marketing experience, and a self-proclaimed "data nerd". His digital marketing agency, CAE Marketing & Consulting focuses on SEO & PPC management, as well as conversion rate optimization. 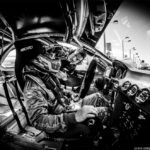 In his (very little) spare time, Carlos enjoys spending time with his family, driving fast around race tracks, and honing in his marksmanship skills with his veteran friends. When it comes to marketing for a small to medium business, you need to think about more than just the visibility or reach potential of any strategy. 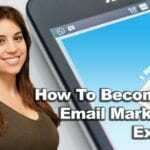 Your campaign needs to be cost-effective and efficient, ensuring you get a good return on investment. In order to ensure that, you have to look at both factors in the short-term and the long-term. 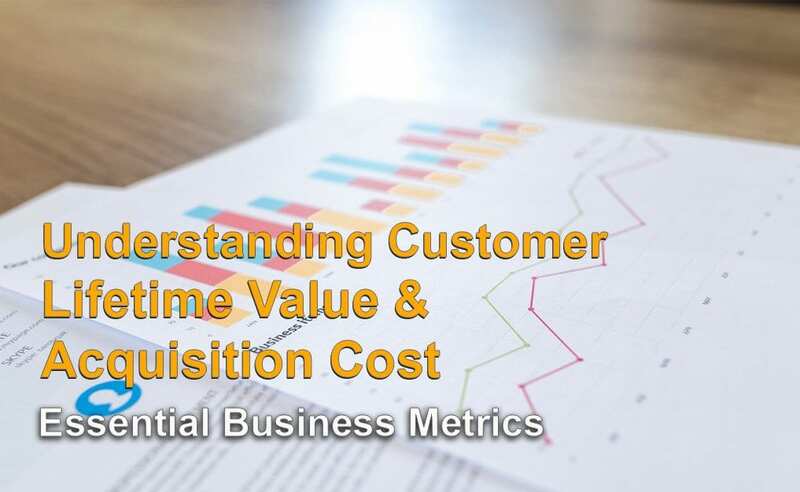 The two metrics most important to measuring the ROI of your marketing campaigns are Customer Acquisition Cost (CAC) and Customer Lifetime Value (LTV). While these may seem like two separate concepts, they are both sides of the same coin. 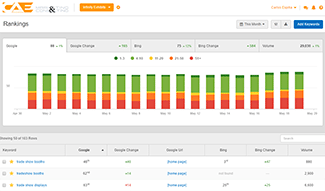 By using a ratio of both metrics combined, you can get a lot more insight into the ROI of your marketing efforts. Before understanding how they work together in the LTV to CAC ratio, it’s important to better understand both metrics in their own right. 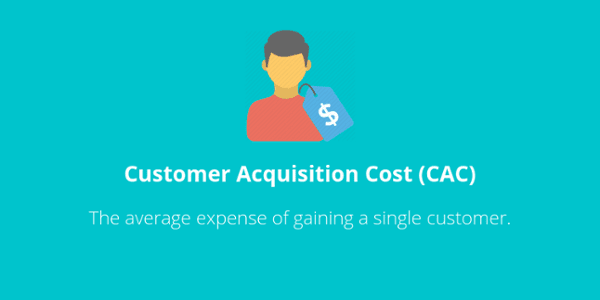 Customer acquisition cost: This is how much you’re spending to acquire new customers and gives insight on sales and marketing efficiency. The smaller your CAC, the better, and you can reduce your CAC in a number of ways, such as better advertising targeting, improved public relations, and a better mix of organic and interruptive marketing. However, when it comes to proving marketing ROI, it has little ability to help business owners understand how much they’re making per customer. Customer lifetime value: This is an estimation of how much your company is going to make in revenue from your customers. It’s a good metric for seeing how well your business is handling existing customer relationships, which can be improved by measuring and reducing churn rate, improving brand trust, and working to improve customer success. However, without any means of seeing how much is spent on earning new customers, it’s hard to measure whether the LTV represents a return on investment. 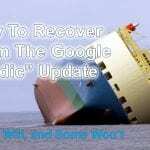 From the setbacks listed in both metrics, it may already be clear how they can work so well together. Many small and medium-size business owners may already be making use of one or both metrics but the discipline of combining them to provide marketing ROI insight is altogether less common. Let’s move on to the ratio. Once you’re measuring both metrics, using them to get a more comprehensive picture on marketing ROI is as simple as putting them together in one equation. 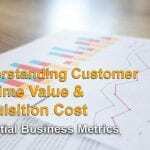 The Customer Lifetime Value to Customer Acquisition Cost demonstrates the revenue you gain per customer against how much you spend per customer. 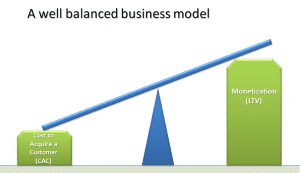 Figuring out the ratio is as simple as dividing your LTV by your CAC. This shows a percentage of the lifetime value that you’re spending on acquisition, which can be interpreted as a ratio. Some prefer to interpret this as a direct percentage: for example, spending 40% of the customer’s lifetime value on their acquisition. Others prefer showing it as a ratio, an LTV to CAC ratio of 5:3 in the example given above. What’s a Good LTV to CAC Ratio? When using a metric, it’s important to have a benchmark to measure the success of your efforts in improving it. When it comes to LTV to CAC, it’s all about the ROI of your marketing strategies. 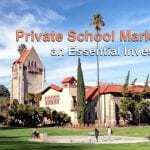 There are a variety of factors that play into what the “correct” LTV to CAC Ratio is. 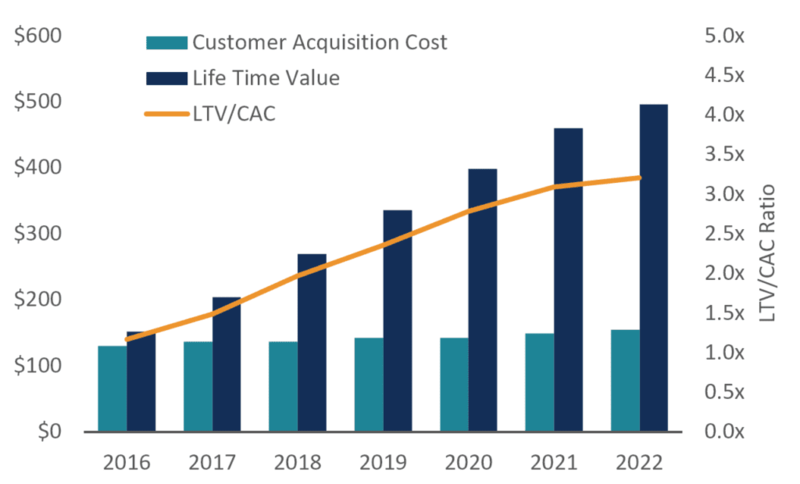 For companies within a growth stage, many recommend an LTV:CAC Ratio of 3:5, i.e., spending 40% of the Customer’s Lifetime Value on Customer Acquisition Cost. However, figuring out the best ratio for your business means taking into account factors such as market size, competitive positioning, which marketing strategies you’re using and so on. Having a low ratio, such as 1:1 or 1:2 means that you’re spending almost as much or just as much on customer acquisition as you expect to make back from them in revenue. On the other hand, if your ratio is too high, such as 1:10, it means that you might not be putting enough effort into marketing and thus leaving money on the table. While you might have a cost-effective marketing strategy, it could be an indicator that you’re business is not attracting new customers or growing. Develop your own benchmarks, based on other goals you want to see (such as growing your market share, improving customer retention, and so on) then use that benchmark to ensure that regardless of your goals, your marketing ROI is always in a healthy range. Like all metrics of marketing ROI, the question of scale can raise some difficulties in getting an accurate representation of marketing ROI. 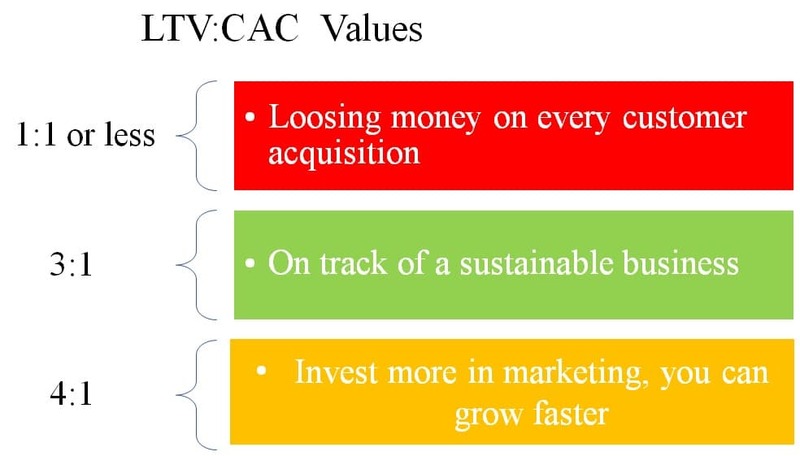 When it comes to finding the LTV:CAC of every individual customer, it can be difficult to determine how much of your CAC should be attributed to a specific customer, as CAC can cover a variety of costs, including sales, advertising, and PR management, not all of which may be applicable for a specific customer. Similarly, aggregating all those costs over a long time can lead to a misleading ratio, as not all the budget spent on marketing and advertising is for the express purposes of customer acquisition. Calculating an effective LTV to CAC ratio is to take a closer look at your CAC, and better understand how much of the marketing budget is spent specifically on customer acquisition and is not only marketing in the nominal sense. There will always be some difficulty in attributing revenue to marketing when finding a justification for how large your marketing budget should be. However, your LTV to CAC ratio can offer some convincing results, which can be tested by seeing how different marketing budgets (such as reducing spend, increasing spend, and weighing spend differently across mediums) affect your overall LTV to CAC ratio. If you’re able to demonstrate that your ratio changes depending on your marketing campaign, then you have found a relatively reliable method of showing the ROI of your marketing. From there, it’s all about using a benchmark to ensure you’re spending enough on marketing to fuel growth, but not so much that you don’t keep enough of the revenue you make as a result. Stay informed with the latest digital marketing news that affect your business, straight from the pros, delivered to your inbox! Don't worry, we'll never spam you (we hate spam too). We promise to only send you the good stuff. Stay informed with the latest digital marketing news that affect your business, straight from the pros! 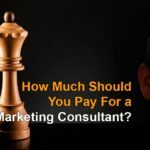 How Much Should You Pay For A Marketing Consultant? 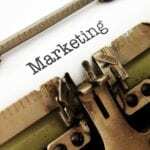 What Should Your Marketing Budget Be?